We have tested one more program for computer monitoring. It is unclear why these problems cannot be solved in more ethical ways. For example, parents can talk to their children, and managers can give to employees clear goals and control their fulfillment. But turn to the technical solution to combat this spyware. 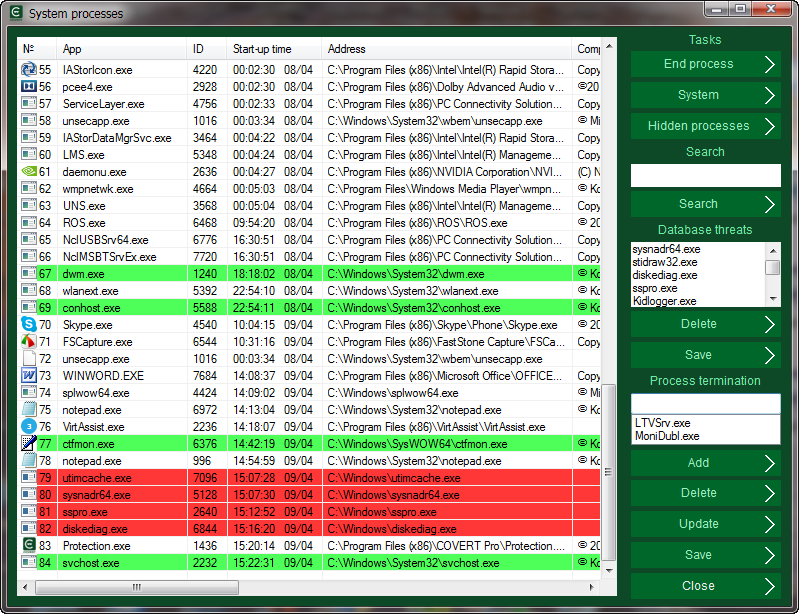 Each user has the right to know how to detect, delete or hide from System Surveillance Pro monitoring. Software developers claim that their program is the best for website monitoring, capturing keystrokes and screenshot support. It allows monitoring on a schedule or by event, and send reports by e-mail. According to our test lab, this program offers an average level of functionality. Its functionality we have evaluated in 5 points on 10-point scale. But the program is not hiding very skillfully and you can simply remove it. We gave it a 1 point in each category. 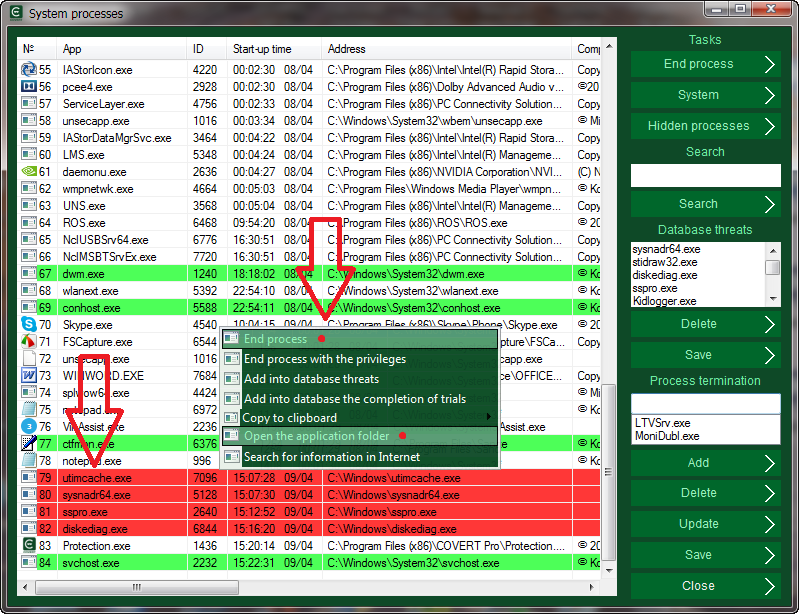 To detect System Surveillance Pro you should open the System processes monitor in COVERT Pro. If the process list has names of applications: utimcache.exe, sysnadr64.exe, sspro.exe, diskediag.exe, stidraw32.exe, System Surveillance Pro is installed and this program carries out surveillance on you. Please note that the spyware files are in the Windows system folder. It’s a hint of belonging to the system applications. After the termination of one process, the other starts it again. Therefore, to remove spyware you should terminate all processes using the context menu. After that, all of these files can be deleted. 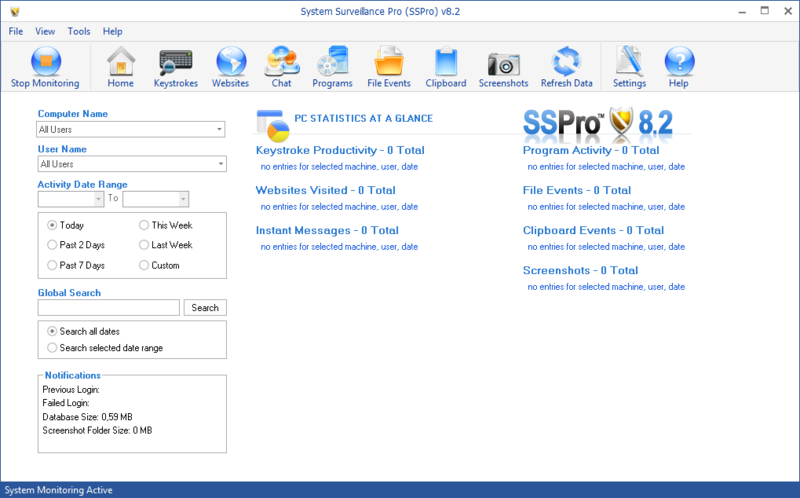 If you just want to hide your actions on the computer from tracking, you may not delete System Surveillance Pro program. Inside of secure platform, you can work without fear that any of your data will be captured by the spyware program, which will continue to operate, but will be unable to intercept and send anything. 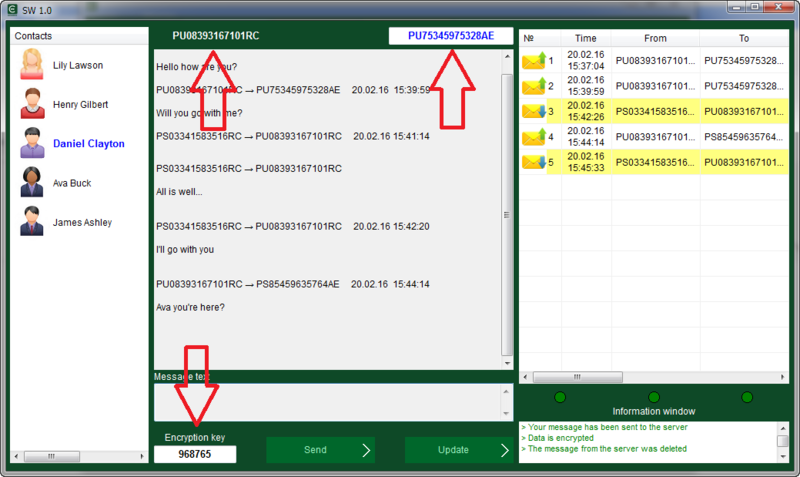 For example, let’s run the built-in instant messenger and send a few messages to recipients from the contacts list. 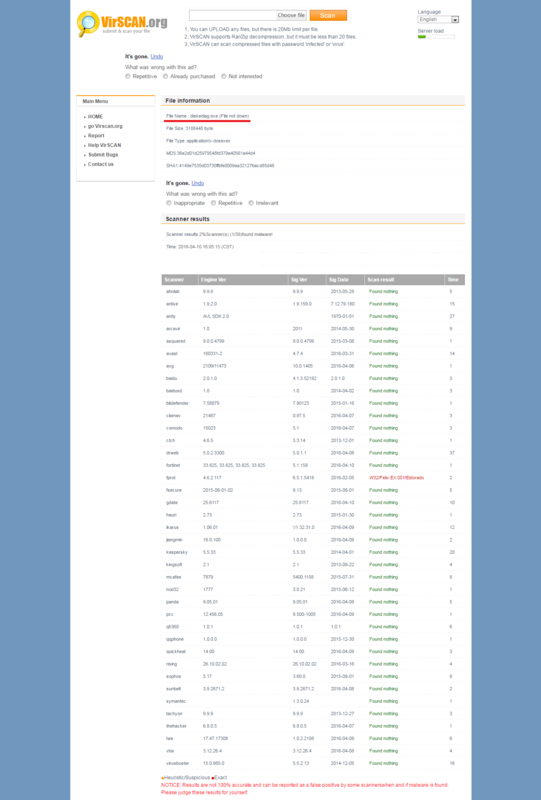 After closing Covert Pro we don’t see the information about keyboard input and messages in the spyware logs. If you have System Surveillance Pro installed on your computer, it is unlikely that anti-virus will help you detect and block it. We have tested on popular web site two files: sspro.exe that is the primary and sysnadr64.exe that controls the entire process. Only one of the 40 antiviruses considers this spyware as a threat. 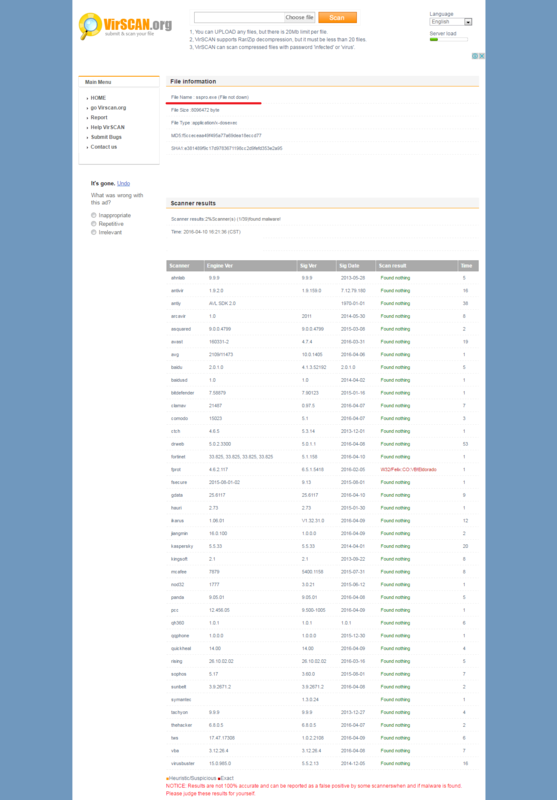 Look carefully at the list of antivirus, maybe you have one of these 39.